Background: Dentists contribute to the prevailing opioid epidemic in the United States. Concerning the population enrolled in Medicaid, little is known about dentists’ opioid prescribing. Key Words: Oral health care; Schedule II substances; opioids; prescription drug monitoring programs; public insurance. 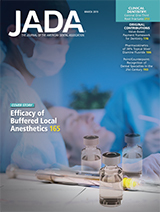 Background: The authors conducted a systematic review that addresses the following population,intervention, comparison, outcome question: “In adults requiring dental therapy with pulpally involved teeth, what is the comparative efficacy of buffered local anesthetics (LAs) compared with that of nonbuffered LAs in achieving anesthetic success?”. Key Words: Buffering; sodium bicarbonate; alkalinization; adjusting pH; local anesthetic. Background: Silver diamine fluoride (SDF) is used topically to prevent or arrest caries. The authors’ aim was to characterize the kinetics of silver and fluoride after topical application of SDF. Key Words: Silver diamine fluoride; clinical study; healthy volunteers; dental. 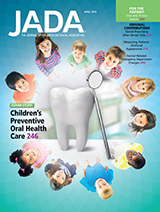 Background: Mouthrinses containing potassium salts have been shown to be effective for the relief of dentinal hypersensitivity (DH) when used adjunctively to toothbrushing with a nonsensitivity toothpaste. Key Words: Dentinal hypersensitivity; mouthrinse; potassium nitrate; desensitizing. 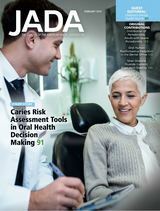 Background: Caries risk assessment (CRA) tools could address oral health disparities and enhance the efficiency of the oral health care system. The authors aimed to explore the feasibility and limitations of using clinical CRA tools in informing oral health care policy-making processes. Key Words: Caries; burden of caries; caries risk assessment; cost of oral health care; oral health care policy; vulnerable population; preventative oral health care. Background: In this study, the authors report on the geospatial distributions of periodontists and adults with severe periodontitis in the United States. Key Words: Demography; oral health care; dental clinics; dentists; oral health; periodontics; population groups; rural population; urban population. Background: Oral human papillomavirus (HPV) infection is the principal underlying cause of a dramatic increase in oropharyngeal cancer. Dentistry can play an important role in developing clinical algorithms for secondary prevention. Key Words: HPV; oropharyngeal; cancer; risk; screening. Get 15% off all Oral Cancer related courses the month of April with Promo Code 15YEARS. Background: As tooth loss decreases in an aging United States, retaining enough natural teeth for function is important for quality of life. Key Words: Edentulism; functional dentition; poverty; oral health; epidemiology; dental public health; National Health and Nutrition Examination Survey; health disparities; adults. Background: Only some states provide coverage of nonemergency dental services for adult Medicaid enrollees. 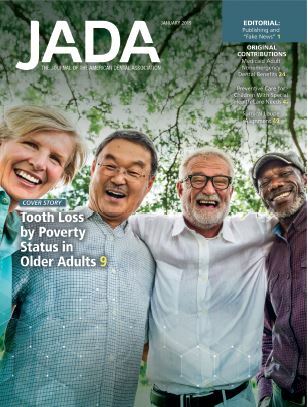 This study examined the association between coverage of Medicaid adult nonemergency dental services and dental services use and expenditures. Key Words: Medicaid; oral health care utilization; dental care expenditures; out-of-pocket costs.